Breastfeeding, it’s the most natural and beautiful thing you can witness. All mammals nurse their young from birth until the littles are ready to go on their own. Most kittens nurse for about 6 weeks, orangutans nurse their young for 6 or 7 years. This is the norm for their species. No one questioned, no one tells them you should nurse longer, nor say it’s time to stop. It’s just something that is. But what about humans? How long is biologically normal for a human to breastfeed? Sadly, due to pressure to wean, mothers returning to work and lack of support, no one can say for certain, but there are some great facts we can use to draw conclusion as to what it could and could not be. There are many reasons to breastfeed. Protection from disease is one of them. Did you know there is strong evidence that a mama has receptors on her breast that essentially read the baby’s saliva? This changes the composition of the milk sending antibodies to the baby through the breastmilk to help them fight infection. Pretty amazing right? God knows what he’s doing people! While Dr. Hinde said that this is just a hypothesis, what HAS been demonstrated empirically, though, is the oral pathway — mom kisses baby’s face and hands, ingests pathogens that baby has encountered in its environment, and then the appropriate antibodies are synthesized in her gut and transferred to her milk. Seriously, amazing what our bodies can do. As a big contrast to the cultural negative views of extended breastfeeding in the US, in Mongolia, it’s celebrated and strongly encouraged. In fact, they declare the best wrestlers are breastfed until the age of 6. Breastfeeding is deep in their culture and an important piece. 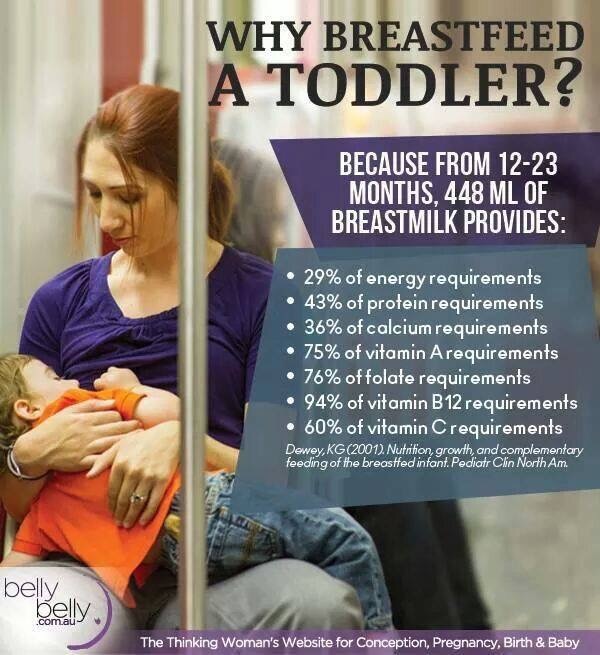 Nutritional benefits of breast-feeding continue well past the first year of life. Here is a great fact sheet on studies supporting these benefits. La Leche Leauge has pages and pages of supportive articles from studies to beautiful articles of real life examples of extended nursing in other countries. God invented breastfeeding and is in full support. Remember when God gave Hannah a son? She promised to bring him to serve in the temple when he was weaned. It’s believed when Hannah brought Samuel there when he was around 3 years old. His youth was mentioned in the biblical text, thus we know he was not an infant or toddler when he was weaned. In this article, Jewish tradition shows weaning took place between 18 months and 5 years of age. Biblical text also point to Isaac winning around 2 to 3 years of age. This 2 part article tells the stories of many biblical breastfeeding women. All blessed by God. So what is the natural age of weaning? When will a child wean on their own? One researcher did an in depth look at primates to help determine. In all the primate species, researchers observed the brain size of the mother played a role in the age they weaned. They also looked at indigenous tribes around the globe to see when their children weaned. It’s the best way to observe since these tribes do not have any contact with each other nor Western culture. Results were very interesting. With an estimated human natural weaning age of between 2.8 and 3.7 years old. When did these indigenous tribe say their child land? It was around age 3. Of course, age 3 is the average age of weaning and some children may self ween before or after age 3. This is not a one size fits all. Try as I may, I could not find any negative effects of nursing past a certain age. This study sought to find negative effects and turned up none. The American Academy of pediatrics recommends exclusive breast-feeding for six months, meaning no other baby foods or cereals. They recommend continuing to breast-feed for at least a year and then as long as mutually desired between the mother and child. This does not say anything about cultural norms. The American Academy of family physicians has the same position of continuing to breast-feed as long as mutually desired by the mother and child. They have a great amount of educational information on their site. The world health organization supports exclusive breast-feeding for six months with complementary foods until at least two years of age, and then as long as mutually desired by the mother and child. La Leche Leauge is a global breastfeeding organizations offering support and resources to women for free. They say a mother and child nursing as long as they wish. http://www.llli.org/faq/bflength.html They support nursing a child until they outgrow the need, just as they would naps, clothes, sippy cups, security blankets, etc. Here is one mom’s journey. Sadly, despite all the research showing the benefits of extended nursing, many moms severely lack support. They are accused of being selfish (you cannot make a child nurse, trust me) or other untrue claims. What if your husband makes unreasonable claims and demands? This is a great article on that topic. Your husband should be your biggest cheerleader and advocate for his child. If he’s making false claims and threats, finding the actual root cause of his feelings can be helpful because the issue(s) will remain even when the child is weaned, thus nothing will be resolved. Forcing a child who is not ready to wean could cause clinginess, fussiness and sleep regression to name a few. In moms, it can lead to depression, clogged ducts, mastitis (a painful breast infection caused by clogged ducts), and resentment among other things. Talk with your husband to come up with something reasonable. Is the child coming to your bed at night the biggest struggle? Maybe compromise trying to get the child to sleep in his own bed. If a compromise can’t be reached, seek counseling from someone educated on breastfeeding. Seem biased? Are you going to seek advanced cancer treatment options from an oncologist or your co-worker? Nutrition advice from your college-age cousin working (and eating) at a fast food burger joint? 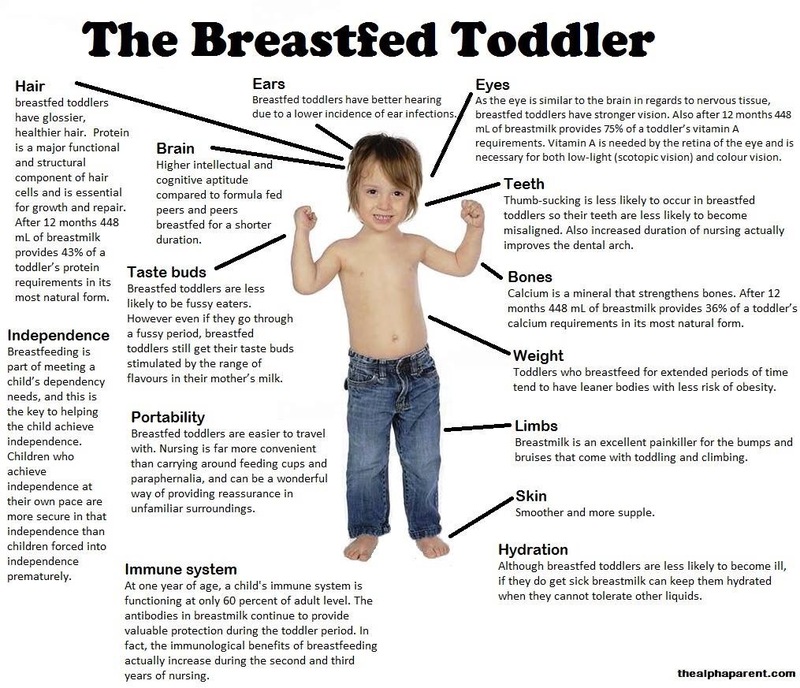 Thus you should also seek advice on breastfeeding from someone educated on the topic. In most cases, it will not be your co-worker. Any ill effects of extended breastfeeding are self inflicted due to personal feelings about it. While I can’t change your feelings toward nursing beyond whatever age you are comfortable with, I do hope you can acknowledge you do not have science on your side. I hope you thoughtfully consider other mothers’ decision to let their child self wean, even if you are not comfortable with that age, they are and it is a decision to be made between the mother and child. But what about teeth? They are asking for it? It’s just for comfort, it’s just for you…. This is a great article tackling 10 myths of breastfeeding older children and why moms continue to meet the breastfeeding demands of their child. Letting a child self wean meets that child’s needs. It’s not wrong, it’s not selfish. It’s natural. Let it be your normal if you so choose. God, science and nature all approve. Whether you feed your baby from the breast, bottle or both, Zulily has great deals from bottles, to nursing covers and scarves, to pillows. Take a look at this deal on a set of 3 9-Oz. Born Free Glass Bottles. They are BPA-free. Deals go fast, so don’t delay! Have you joined zulily? It is a fantastic daily deals site offering up to 70% off boutique brands for moms, babies and kids. Browse for unique apparel, gear, toys, accessories and more – great selections for kids of all ages and some great steals for parents, too. The sales only last for a little while so sign up for your free membership to receive access to the site and a daily sales email with all of the scoop. After a too long break, I’m getting back into the game! I look forward to bringing you more great information, challenges, and resources you can consider. I’ll share fun family and kid crafts or outdoor fun. I’ll also share great deals on some of my favorite Eco-friendly, safe, ethical, fair-trade or sustainable products. I will do more product reviews as well. I look forward to seeing what’s to come and hearing your feedback. I finally go on the bandwagon and created my Facebook page. I hope you will come “Like” me there and invite your friends to learn more about eco-friendly living and keeping toxics away from our children. I have added a few Hape Toys to my “Shop” page. I recently discovered Hape toys and fell in love with the look, quality and commitment to safety. Hape has a wide variety of toys for pretend play, learning toys, puzzles, infant toys, wood vehicles and much more. I have a limited quality, so get them while you can! The space ship toy is already sold, but if interested, please send me your name and I can let you know when I order more.